A handmade coconut lion stands guard over his bamboo tubes. 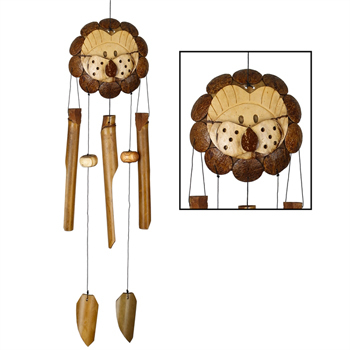 Bamboo gives the Asli Arts wind chimes a mellow, musical and enchanting sound unlike any other windchime. Each piece is individually hand-carved and handcrafted. By hand-toning each tube and selecting a range of sizes, our craftsmen ensure that each chime will produce a unique melody.